Somerset….New York….Primrose Hill. The Cowshed spa and cafe arrived on Regent’s Park Road in time for Christmas 2013, the latest outpost in the Soho House chain that began life at Babington House in 1998, and now counts nine spas across three countries. 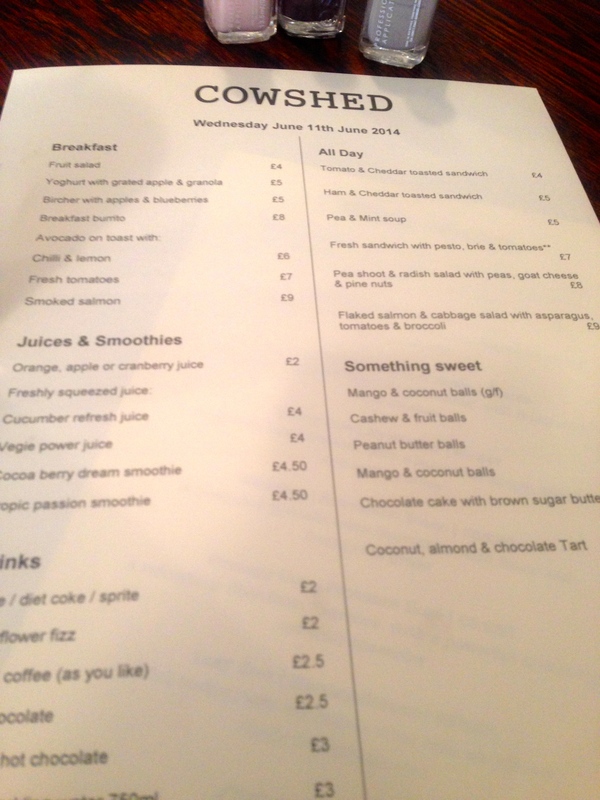 Situated on the previously unexciting though pretty strip towards the Chalk Farm Bridge, the Cowshed’s perfectly-pitched casual chic now brings a touch of charm – and surely footfall – to that end of the village. So this week I allowed my own footfall to take me through the door, and, staying with the theme of footfall, I booked myself in for the Cowshed Ultimate Pedicure, 75 minutes of ‘the ultimate in foot care’ for £55, with lunch in the cafe beforehand. All to be reported back to you, dear reader. And with the World Cup underway, forgive my football analogy: my experience at the Cowshed was very much a game of two halves. The first half was spent in the cafe. Having arrived at 12.40pm, lunch was in order, and choosing from the menu headed with the date, I asked for the salad of pea shoots, radish, peas, goats cheese and pine nuts, priced at £8 and, as it was a hot day, ‘cucumber refresh juice’, priced at £4. THE MENU OF THE DAY, THAT WASN’T QUITE. 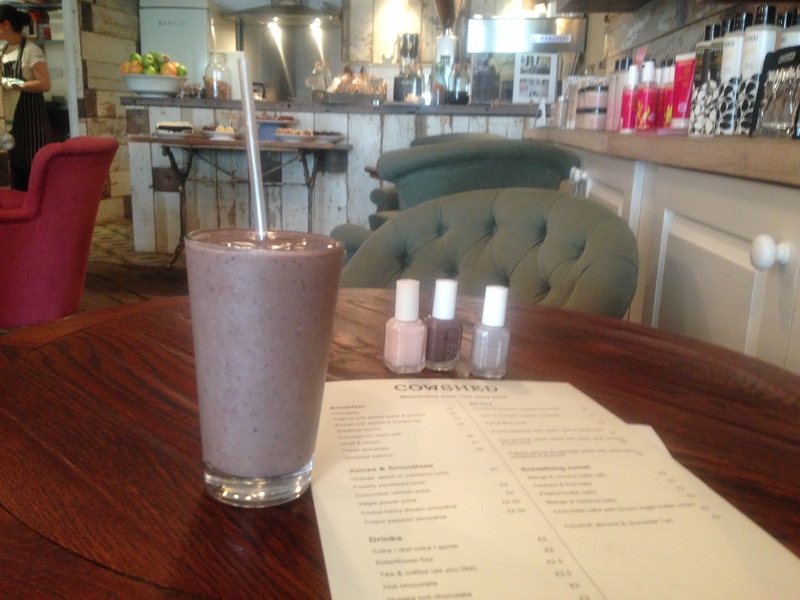 Sadly, according to the waitress, there were no juices, no matter what the day’s menu might say, and instead I was persuaded to give the ‘cocoa berry dream smoothie’ a whirl, described to me as a blend of cocoa powder, avocado, banana and blueberries. In due course, the smoothie arrived, but with the unusual news that, despite it being lunchtime, the chef had ‘gone somewhere.’ It wasn’t clear where he was or when he would be back, so the salad was unavailable; however, I was offered avocado on toast instead, which apparently didn’t require the chef’s input. Slightly perturbed that a chef in a cafe would go AWOL at lunchtime – maybe he had gone out for lunch – I passed on that and made do with just the smoothie, which turned out to be a chocolate milkshake with undertones of banana. I had been hoping for more evidence of the avocado and berries, which might have made it more interesting and nutritious, and I certainly wouldn’t have ordered the drink I was served, had I been clearer about what it actually was. So my plans for lunch were thwarted; on to the second half: the pedicure. Here, things looked up enormously, and it was all rather fun. Manis and pedis take place in a bright and breezy space, with a cleverly-crafted beachy feel. Ensconced in a huge armchair with my feet in a tin bath, a large V-cushion was placed across my front and I was offered the headphones for the TV in front of me. Meanwhile, the beauty therapist cracked on with a busy schedule of all that is required for beautiful feet, plus an ample dose of massage, not just of my feet but to my scalp and shoulders as well. An hour and a quarter later, not only did I have very pretty feet, ready for my summer sandals, but I had taken on a sense of relaxation and well-being that has lasted. How much did I spend? £55 for the pedicure, £4.50 for the smoothie. Certainly expensive for a pedicure and more of a treat than an option for regular maintenance, although the Cowshed does offer cheaper and faster pedis. Enough said about the smoothie. Would I go back? Yes, definitely for more treatments, but next time I’ll have lunch somewhere else.